My Home and Garden: Our garden will look much like this. The greenhouse is perfect. Our garden will look much like this. The greenhouse is perfect. Sadly, this is not my yard. I cannot remember where this picture came from, but I love it. It is inspirational. It is what I have in mind for the garden next door. 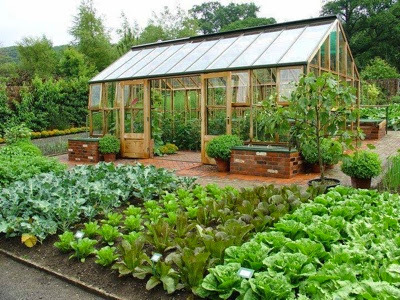 We want a greenhouse in the middle like this and that is taller than most. It will be a citrus house. The citrus, currently a Meyer Lemon, Bearrs lime and a Owari Satsuma mandarin, will be planted in the ground and there will be a heater for winter. I won't be getting a greenhouse for a while, so in the blueprint I'm working on, I will only plan for annuals where it will be eventually. There will also be a small orchard. I see they have a fig in a large pot. Funny, so do I. I love gardening. That garden in your pic is excessively neat - even by my standards! Who needs that many lettuces ready all at the same time?? The potted fig though is something I like - I have one that is now about 3 feet tall. What an inspiring picture! You know, I was inspired by a Martha Stewart magazine garden photo when we started here in 1999. Good plan Erin. Too funny, you are so right. But it sure looks pretty with them all exactly the same. It looks like not a single leaf has been taken. Mine would look pretty ratty by then. I would love to see that picture Brenda. Do you still have it? I thought it got windy over here in Sidney! yes i do. maybe I can photograph the pages and send those to you? I got them Brenda. OMGOSH. You and the captain did an unbelievable job creating your garden using the pictures. I am in awe!! I am now inclined to use this is more of blueprint rather than inspiration. Thank you. An inspiring veg garden, Erin... I would love to have ones, thanks for sharing. I feel extremely lucky !! My son and his wife move into this house next week, and the garden shall commence!